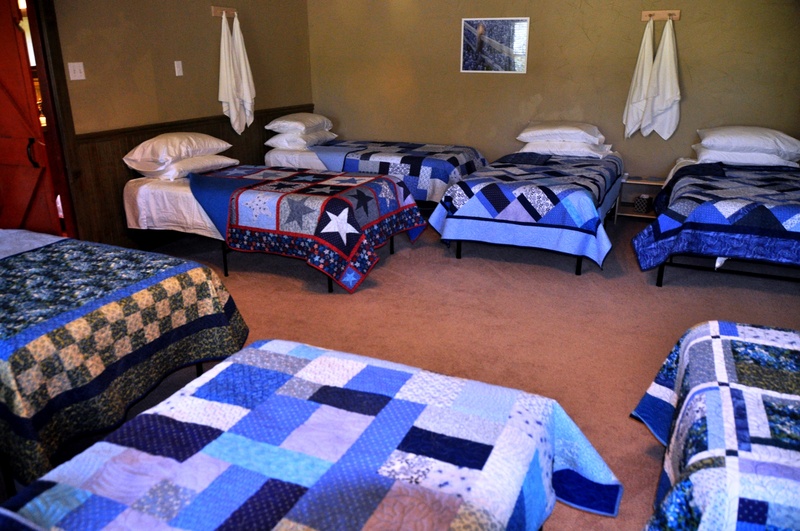 Twin beds, 2 pillows, nightstand, and custom made quilts adorn the 4 main bedrooms. 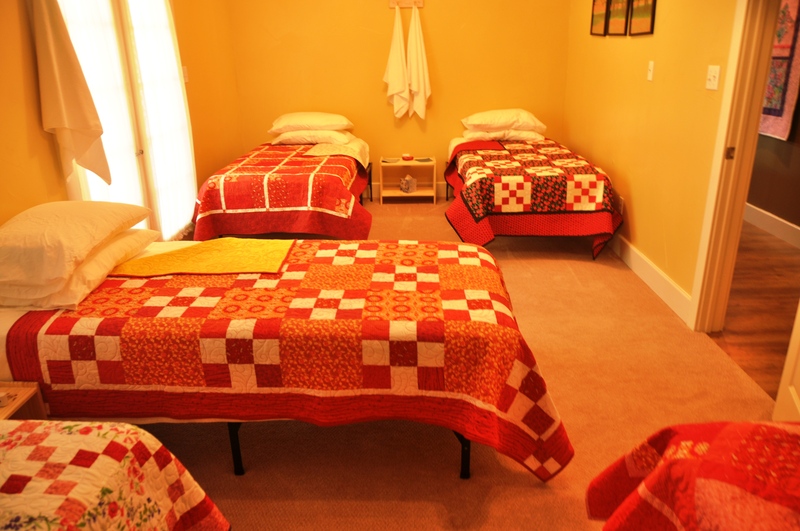 Each bedroom is served by a private bathroom with a walk-in shower. Towels, hand towels, hair dryer, and wash cloths are furnished. Guest supplies own toiletries, shampoo and soap or body wash.
Closets for storing luggage and hanging clothes are available in each bedroom. 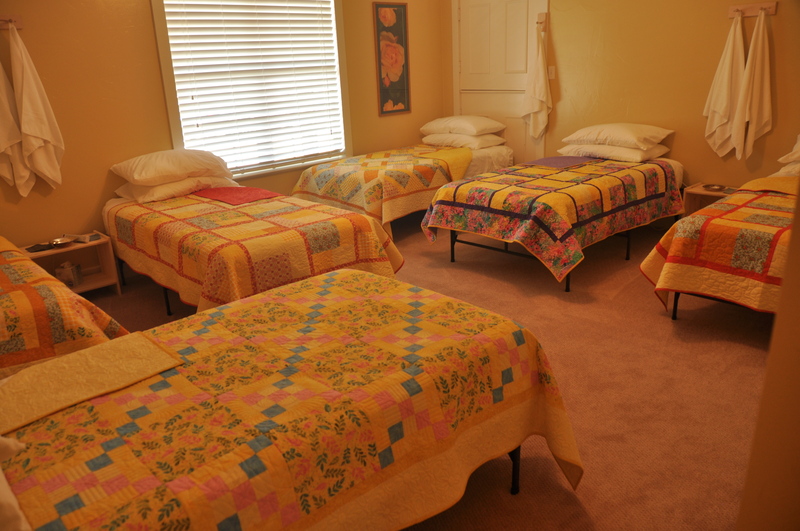 If you want a room by yourself, ask about the new Wisteria Room! 6’ table per guest with ergonomic task chairs. Table shelving for extra work space and stacking tools. Ample work space for guests’ Cricut, iron, laptop, etc. Design walls for quilters, with ironing and cutting centers. Wireless internet for digital scrapbookers. Guest refrigerator provided to store drinks and snacks. Multi-plug outlets and USB plugs (for phones) at each work space. When you arrive on Friday, freshly prepared meals begin with lunch around noon and dinner about six. Continental Breakfast with a crust-less quiche is available on Saturday and Sunday morning. Lunch and dinner are served on Saturday with the final meal being lunch on Sunday. Want an extra long weekend then add Thursday on for just $15 (no meals) and you can come in at 9am on Thursday. The breakfast bar is available 24/7 and includes: fruits, juice, milk, eggs, and dry cereals. A microwave, toaster oven, and electric tea kettle are always available. Coffees and teas are available 24/7 and we have a Keurig, if you want to bring your own pods. Guests may bring their own assorted beverages to store in the refrigerator in the individual craft rooms. Please contact the retreat center no later than 5 pm the Sunday prior to your stay if you have food allergies, are a vegetarian/vegan, or have other dietary restrictions. We will do the best we can to accommodate your needs. Massage therapy and embossing available onsite for additional charges. Internet and Wi-Fi are available. There is a TV and DVD player in the living room, so you might want to bring some movie favorites. The retreat center is fenced and gated. After the last guest arrives each evening, the front gate can only be accessed by the property manager on duty. 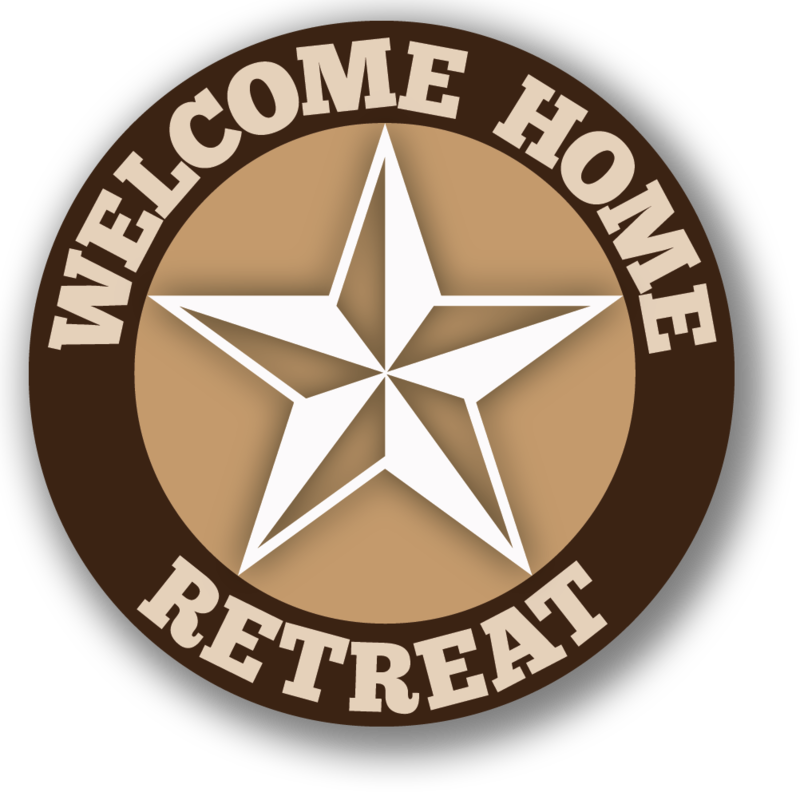 Welcome Home Retreat is open every weekend but Thanksgiving and Christmas. We also have NO MINIMUM group size requirement which means you can come out by yourself if you wish. This also means, if the weekend is full, you could be sharing a room with someone you may not know. What a great way to meet new friends. Cut off time for any changes to your weekend is 5 pm on Sunday before your stay. $225 per guest includes 3 days beginning on Friday and ending on Sunday. Want an extra long weekend? Add Thursday for $15. Groups of any size ranging from 1 to 27 ladies can be accommodated. Individuals not in a group are also welcome. A deposit of $50 will reserve one spot. The full amount is due 30 days prior to the arrival date. If the balance is not received 30 days prior to the retreat, a reservation may be cancelled, and the deposit may be forfeited. 60-day or more cancellation notice is eligible for a full refund less a $25 processing fee. 30-59 day cancellation notice results in a forfeiture of the deposit. Less than 30-day cancellation notice will result in no refund being given and the balance in full, if not already paid, will be due immediately. Should a reservation be cancelled by us, due to no fault of our own (natural disaster, property emergency, etc. ), a reservation may be transferred to another weekend or refunded in full. Welcome Home Retreat LLC is not liable for any loss, damages or claims resulting for any reason whatsoever for events outside the control of Welcome Home Retreat LLC including, but not limited to theft, loss of power, utilities, service interruptions (cable, internet), etc. No Smoking or E-cigarettes are permitted on property. Damage to the property and missing items will be charged to the person making the reservation. We reserve the right to change the above policies at any time, without notice.